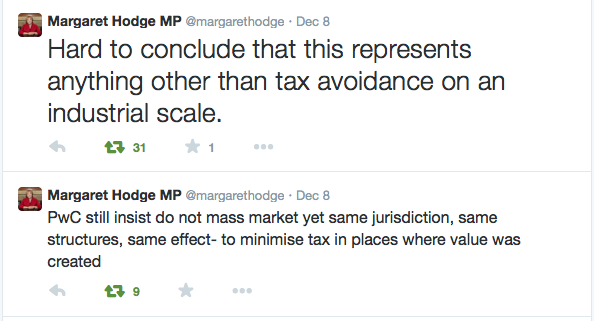 On Monday of this week, British MP Margaret Hodge grilled Kevin Nicholson, lead partner of PwC’s UK tax practice, in a Parliament Public Accounts Committee hearing about the firm’s Luxembourg tax arrangements. This follows the International Consortium of Investigative Journalists’ (ICIJ) LuxLeaks investigation announced November 5. Hodge accused Nicholson of lying to the committee. A key issue was whether PwC had sold the tax schemes or clients bought them. When it comes to allegations of tax abuse, there’s a world of difference. It’s true that the loophole for auditors and tax advice left in SOx is big enough to drive your entire diverse staff through in a rainbow colored double-decker bus. However, PwC and others crossed the line by designing and mass-market selling speculative, aggressive tax avoidance schemes to audit clients, too. That’s prohibited by SOx and by general auditor independence principles, for sure. PwC is also asking for big trouble from the SEC and PCAOB in the US by providing “novel and debatable tax strategies and products that involve income tax shelters and extensive off-shore partnerships or affiliates” to its own audit clients. PwC audit clients make up a very large portion of the 340 Luxembourg tax advice clients on the ICIJ list. PwC must comply with US SEC auditor independence rules under the Sarbanes-Oxley Act of 2002 for US-listed audit clients. That’s prohibited by the Sarbanes-Oxley Act of 2002. 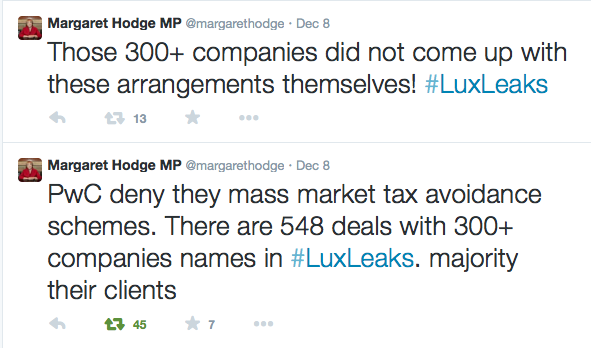 Urging PwC “to just clean up your act”, Hodge, who has led complaints about multi-nationals’ tax habits, said its Luxembourg operation seems like “a murky underground pool with dodgy operations”. “You talk about material being stolen from PwC. In my view you had whistleblowers and you will continue to have whistleblowers for as long as you take this attitude. I will invite them to write to me on a confidential basis,” she said. “I can’t think of a company who would want to do business with you if they think they are going to end up in the New York Times or the Guardian because you are simply indulging in scams,” she declared. I wrote a more detailed description for Medium.com of the tax scheme PwC devised for audit client AIG, while the company was majority-owned by the US government during the financial crisis! The US government didn’t take advantage of the financial crisis and its enormous conflicts to rotate auditors at any of the bailed-out companies it nationalized. All of the companies the US government controlled for a time — GM (Deloitte), Citi (KPMG), Freddie Mac (PwC) and Fannie Mae (Deloitte) — use the same auditors that missed the issues that led to the crisis and the same ones that neglected to provide a “going concern” warning to investors or taxpayers before failure was imminent. The US Treasury and the Fed looked the other way when AIG hired PwC to implement tax avoidance strategies. PwC had the unmitigated by government oversight nerve to sell tax avoidance schemes to its beleaguered, teetering on bankruptcy client AIG that took even more money out of US Treasury coffers. 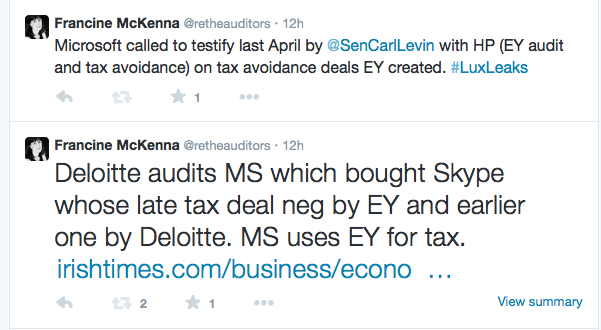 The ICIJ has just yesterday exposed more Big Four firms doing more tax avoidance deals for more audit clients. Microsoft’s Skype is also mentioned along with a few others. This story is not going away for PwC. The challenge is for the PCAOB and SEC to do more than one-off investigations like the one requested by Senator Levin regarding PwC’s marketing of tax schemes to audit client Caterpillar. 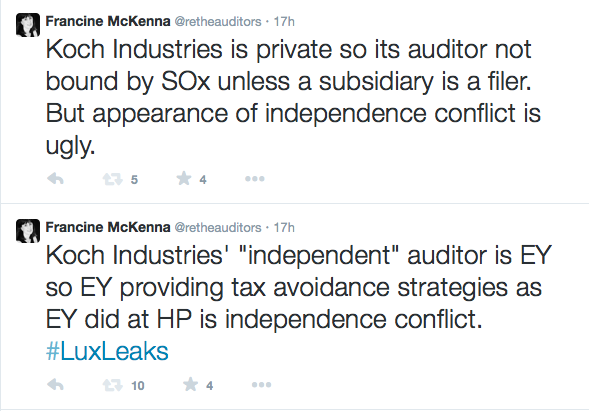 Unfortunately, if the SEC and PwC took on the widespread systemic abuse of auditor independence and the public trust evidenced by just PwC’s mass marketing of “tax avoidance on an industrial scale” to its audit clients alone, the implications would be much more serious than the individual fraudulent tax fraud that almost brought down KPMG in 2005. Since the US and UK government have an implicit “too important to indict, too few to fail” policy with regard to the Big Four audit firms, regulators and legislators must take dramatic action to enforce laws already on the books and close down the “murky underground pool with dodgy operations” immediately.